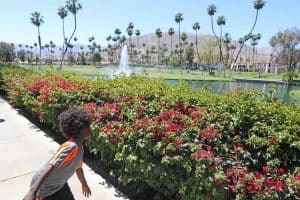 Lately, I have been on the lookout for kid friendly hotels in Palm Springs with water slides, and it was at that point that I came across the Omni Rancho Las Palmas Resort & Spa which is a kid friendly resort in Palm Springs. 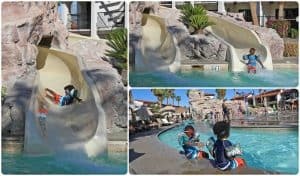 I was excited to find out that it has a water park called Splashtopia with a lazy river pool. 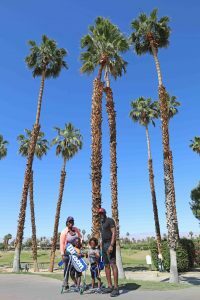 I immediately added it to my things to do in Palm Springs list. 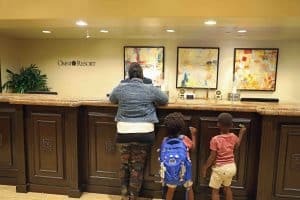 I was looking forward to staying at this resort because I knew that the kids would love it. 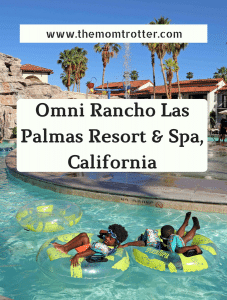 Even though the prices listed on the Omni Rancho Las Palmas Resort & Spa were much higher than I wanted to pay, I still booked marked it in the hopes that the price would drop. 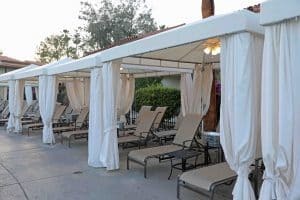 A week before we went, I was browsing Groupon, like I normally do for deals, but most especially travel deals and I was excited to see Omni Rancho Las Palmas Resort & Spa listed with much better rates, rates that I could afford. In addition to that, Ebates was offering 6% cash back on all Groupon purchases so I went ahead and booked a room for us for 2 nights. 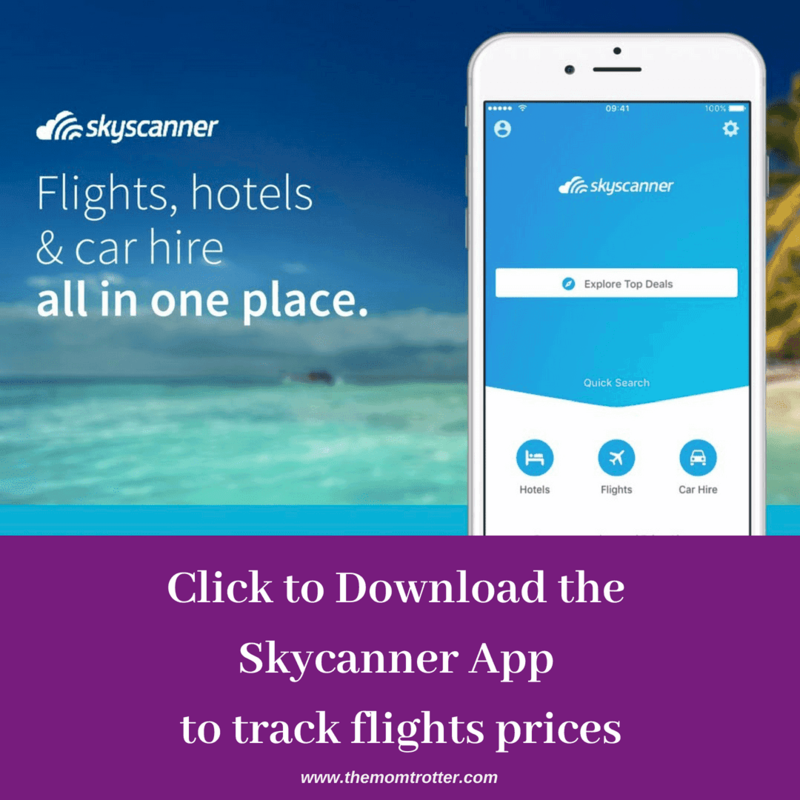 [Click HERE to join Ebates for free and receive a $10 bonus]. We left the house much later than I expected us to, and also made a stop for dinner before heading to our hotel. We checked in at about 9pm instead of the normal 4pm check in time. Because of this we lost a whole day at the resort which isn’t so bad, but I am all for maximizing time. The hotel allows you to check in early and head to the pool while waiting for your room to be ready. I love that they offer this option, so even if you are staying for only one night, if you get in early, you can get a whole day’s worth of pool time before you have to check out the next day. At check-in, we were shown a map of the property and I requested a building close to pool. I was informed that requests aren’t always granted, but because they weren’t fully booked it wasn’t a problem. 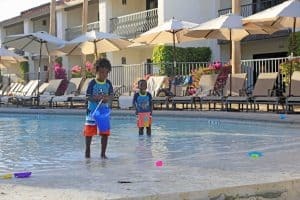 We chose building 28 which had a great view of the golf course, as well as just a short 2 minute walk to Splashtopia water park. I highly recommend building 28, as as we loved our room location. 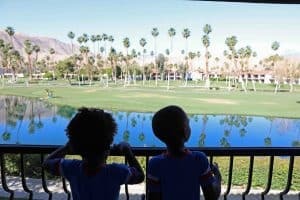 They also have pool view rooms, but one of the reasons I love Palm Springs / Palm Desert is being able to stare at the beautifully manicured golf course. When I picked out our room on Groupon, I chose the option for the room with a king bed and pull-out couch. 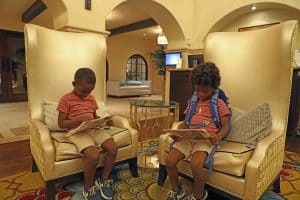 This room has a capacity of 4, 2 adults and 2 kids, 12 and under stay free. 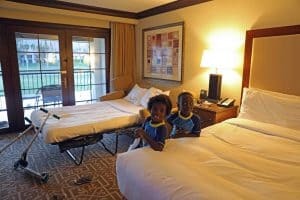 They also had rooms with 2 queen beds but the boys love sleeping on the pull out couch. For some reason they think it is really cool, so we usually pick a room with one. 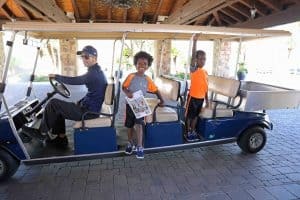 You can walk around the resort to get to where you need to, but when it gets really hot in the summer, 100 degrees Fahrenheit plus, it is so much nicer to just ride the golf cart around. All you have to do is make a call from your hotel room, and they’ll send someone to you right away. If you aren’t in your hotel room, you can call the front desk from you cell phone to request a golf cart to pick you up. We did have an incident, when the driver made a sharp quick turn and Aiden went flying off. It was a bit scary too, but thankfully he wasn’t hurt too bad, just a scraped knee. 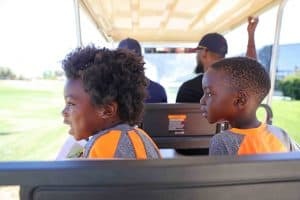 The boys were sitting together on the seat in front of me when this happened, however I definitely recommend sitting with your kids and holding their hand, and/or reminding then to hold on tight to the handle bars. After Aiden fell off the golf cart, he didn’t want to ride it anymore, so we decided to walk while the boys rode their scooters around. If your kids don’t own a scooter, I highly recommend you get them one. I knew I wasn’t going to be tired walking around the property, but I wasn’t sure about how the boys were going to feel. With their scooters in hand, there was zero complaint about being tired. 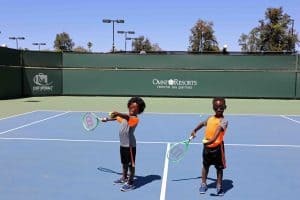 One of the places the kids rode their scooters to was the tennis court. 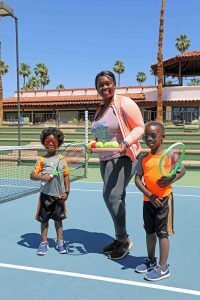 We all love playing tennis, so we packed our tennis rackets. I love the Wilson brand, so we all have Wilson rackets. 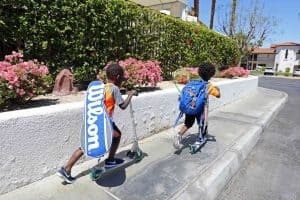 The boys both use the Wilson 21in which is for kids 5-6yrs old. 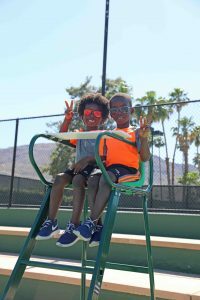 We packed tennis balls, but were so happy to see that they had several on the court. With the boys practicing, it came in so handy. We could practice for a while before having to pick up balls. I also like that they had a water dispenser with cold refreshing water, and an extra gallon on the side. Our bottled water got hot after sitting under the sun so this was a plus. 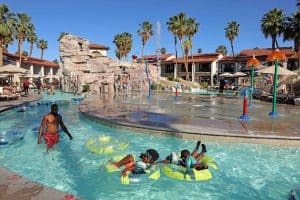 The kids favorite part of the hotel, definitely Splashtopia at Omni Rancho Las Palmas. 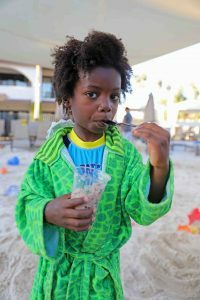 The water park has a lazy river, a splash/spray area, two slides and a zero entry side with sand which is perfect for babies/toddlers. 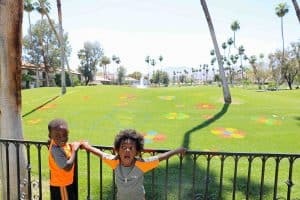 So many things to do to keep the kids busy. 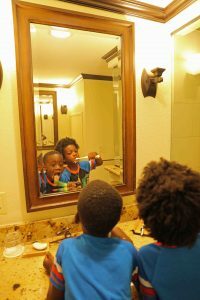 This was the main reason why we chose this hotel and it did not disappoint. Because we stayed here on a week day, it wasn’t crowded at all, which I much prefer as I don’t like crowds. The sand area is shaded which is nice because in the middle of summer, it can get very hot. They have tubes for the water park, but no floaters or life vests, so if your kids still need one, make sure to take it with you. I highly recommend the speedo floaters that the boys are wearing. 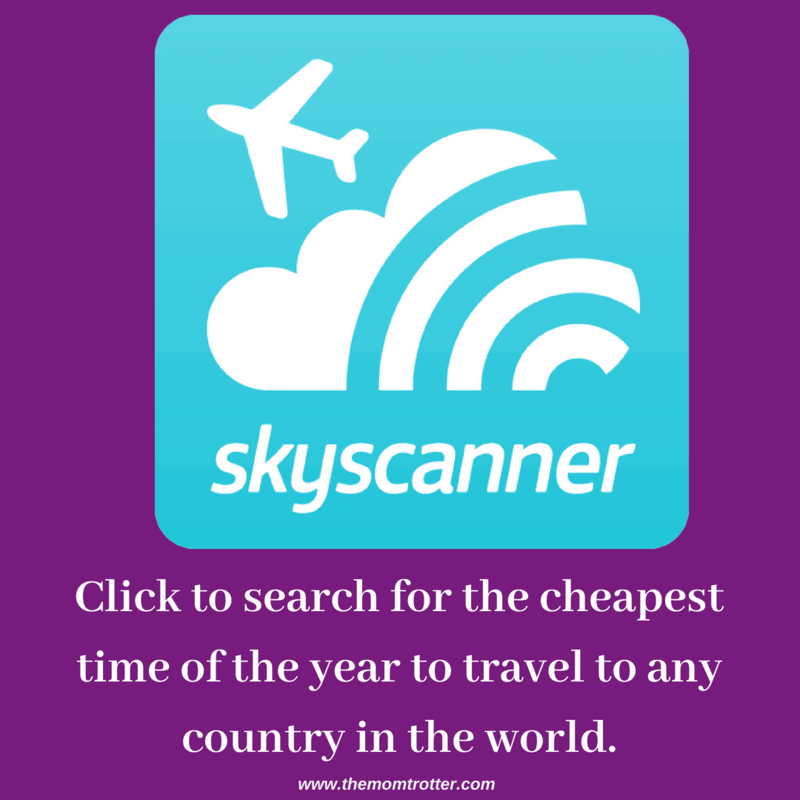 They are easy to inflate and deflate and pack for travel as needed. There are poolside cabanasas well, if you want to hide from the sun, poolside cabanas with beds would have been so much better though. Who doesn’t love comfy pool side naps? 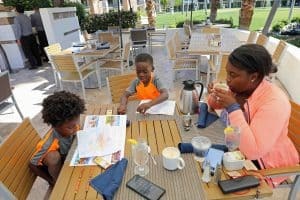 When we got hungry by the pool, we were able to order food. I usually don’t enjoy hotel food but to my surprise it was yummy. 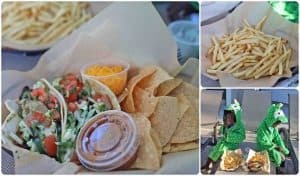 I ordered tacos for my husband and I, and the boys had fries. Aiden asked for ice cream so I ordered dipping dots for him which he enjoyed. 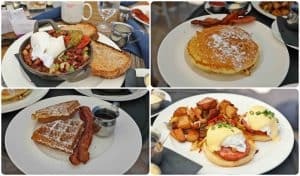 During our stay, we ate breakfast at bluEmber, which is their on site breakfast restaurant. Kids 5 and under eat free as long as they order from the kids menu which I think is such a good deal. We all enjoyed our breakfast. 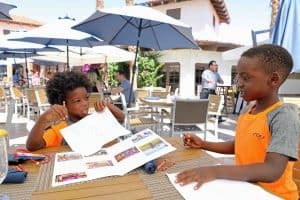 The were given crayons and the kids menu which had activities to keep them busy before the food arrived. I loved that because I was able to drink my coffee hot while the boys did some writing. Drinking a hot coffee is rare when we eat our with the kids so that was a win for me. The resort has really beautiful grounds. Perfect for a morning, afternoon or evening stroll. After breakfast we opted for a walk to our hotel room to burn off some calories from our yummy breakfast. 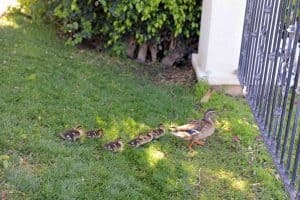 The boys spotted a family of ducks and got excited, followed them and they ran away. I was a little bummed out because there were a few things that weren’t available because we stayed there during the week, and also because it wasn’t summer yet. 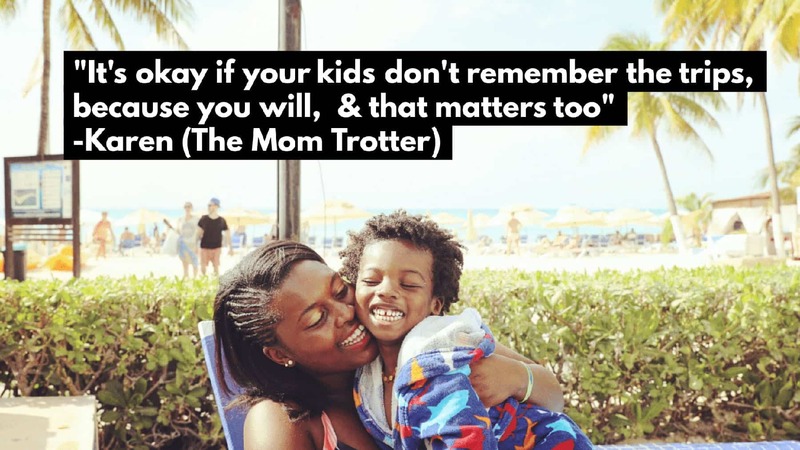 We missed out on the kids club, the arcade and the marshmallow roasting, these 3 are things they boys would have loved to do. They do offer them, however at different times of the year. 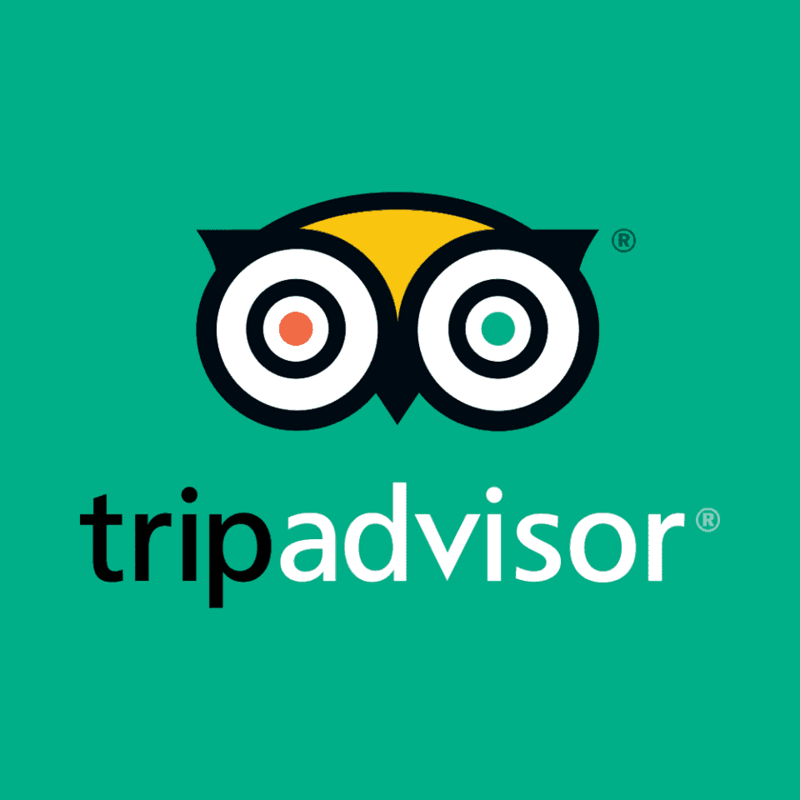 If any of those are of importance to you, definitely call first to make sure before you book. Also, at check-in we were given the schedule of activities and 95% of them were listed for Friday, Saturday and Sunday. 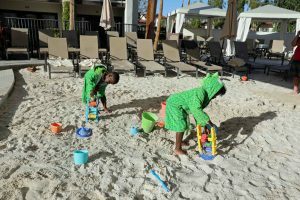 They did have pool side movie night during the week, but the majority of activities were scheduled for the weekend. 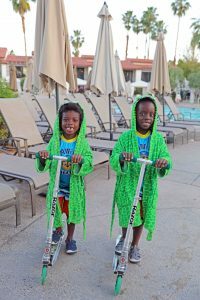 Overall we had a great time at Omni Rancho Las Palmas Resort & Spa and I would definitely stay there again. It was a nice and relaxing getaway from Los Angeles. 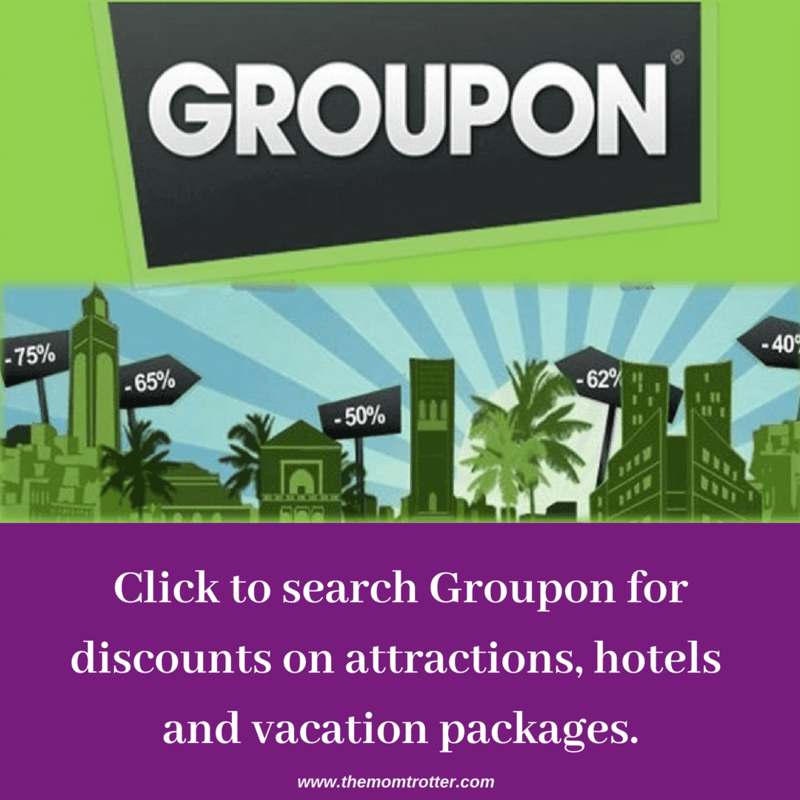 I wouldn’t book this hotel at full price or during high season as it is way over my budget, but for how much we got it on Groupon, it was definitely a good deal. 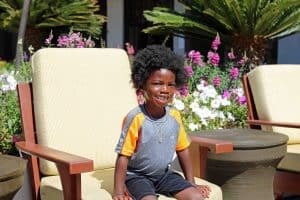 If you’re looking for a place to take your kids on a stay-cation within California, I highly recommend you take them here. The water park is enough to keep the kids busy the whole day. This is awesome! 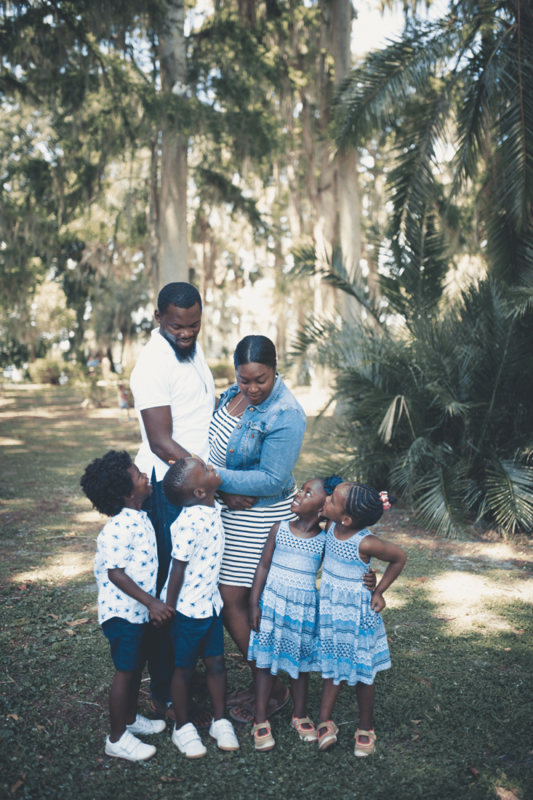 We will be taking our kiddos to Hawaii for our 10th wedding anniversary and I’ve been thinking of a night or 2 in Cali to break up such long travel from the east coast. This would be perfect! Thank you for sharing. You’ll love it. Just remember is is about 2hrs out of LA, but totally worth it.